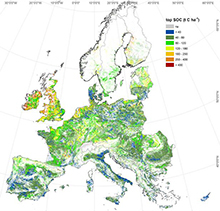 Data (2014) related to Pan-European SOC stock of agricultural soils, containing GIS maps for a) Pan-European SOC stock of agricultural soils (shapefile), b) Potential carbon sequestration by modelling a comprehensive set of management practices (shapefile), c) Average Eroded SOC in agricultural soils (raster). Methodology - Metadata: Application of CENTURY model. More details can be found in the A new baseline of organic carbon stock in European agricultural soils using a modelling approach. Global change biology or contact the first author. The future EU policy in agriculture will utilized SOC as indicator, both as a main parameter of soil quality and as a strategy to offset CO2 emission by C sequestration. However a consistent picture of agricultural SOC stock is missing as well as tools to orient the future policymaker decisions. To fill this gap, the JRC developed a comprehensive modelling platform with comparable and harmonised European geographical and numerical datasets. We estimated a current top SOC stock of 17.63 Gt in EU agricultural soils, by an unprecedented model application running about 164,000 combination of climate, soil and land use/management. A comprehensive model platform was established at a pan-European scale (EU + Serbia, Bosnia and Herzegovina, Croatia, Montenegro, Albania, Former Yugoslav Republic of Macedonia and Norway) using the agro-ecosystem SOC model CENTURY. The model was implemented with the main management practices (e.g. irrigation, mineral and organic fertilization, tillage, etc.) derived from official statistics. The model results were tested against inventories from the European Environment and Observation Network (EIONET) and approximately 20,000 soil samples from the 2009 LUCAS survey, a monitoring project aiming at producing the first coherent, comprehensive and harmonized top-soil dataset of the EU based on harmonized sampling and analytical methods. A detailed explanation of the methodology and the platform of simulation developed could be found in: Lugato E., Panagos P., Bampa, F., Jones A., Montanarella L. (2014). A new baseline of organic carbon stock in European agricultural soils using a modelling approach. Global change biology. 20 (1), pp. 313-326. This work is part of the CAPRESE project (CArbon PREservation and SEquestration in agricultural soils), an administrative arrangement between the JRC and the Commission - DG AGRI undertaken to develop policies addressing climate change soil-related aspects in European agriculture. Metadata for "Using soils to mitigate carbon emissions"
AR_GR_LUC = conversion from arable to grassland; AR_RES = crop residue management; AR_RT = reduced tillage; AR_RET = crop residue + reduced tillage; AR_LEY = ley in rotation; AR_CC = cover crops. The dbf files contain the SOC changes related to the application of AMP in the arable land. Fields: [y2020, y2050, y2080, y2100] = Soil organic stock difference (t C ha-1) between AMP and the arable land use in the projected years. [st2020, st2050, st2080, st2100] = Uncertainty related to climatic scenarios. Instructions: values = 0 are units not simulated. Important Note: Further improved versions will be released in the next years. JRC scientists found that making alternative uses of arable land could potentially help capture significant amounts of carbon from the atmosphere. They investigated the potential carbon sequestration of six of the most representative agricultural management practices on arable soils, and finded that the conversion of arable land to grassland results in the highest potential soil organic carbon (SOC) sequestration rates, whereas the conversion of grassland to arable land has the effect of strongly increasing the amount of carbon losses to the atmosphere. The scientists have used a recently developed high resolution pan-European simulation platform to assess the potential impact of six management practices on SOC stock levels of arable soil under two IPCC climate change scenarios to 2100: arable to grassland conversion (and vice versa), straw incorporation, reduced tillage, straw incorporation with reduced tillage, ley cropping and cover crops. According to the results of three policy simulations carried out by the scientists, the allocation of just 12% of arable land to different combinations of agricultural management practices would produce significant mitigation effects, which would be sufficient to reach the EU's target of cutting its emissions to 20% below of the 1990 levels by 2020. A detailed explanation of the methodology and the scenarios could be found in Lugato E., Bampa F., Panagos P., Montanarella L. and Jones A. (2014). Potential carbon sequestration of European arable soils estimated by modelling a comprehensive set of management practices. Global Change Biology (2014), 20, 3557–3567, doi: 10.1111/gcb.12551. More information about the Pan-European Soil Organic Carbon (SOC) stock of agricultural soils can be found in the corresponding section. Metadata for "Erosion integration in the European Carbon balance"
Methodology: Distribution of average eroded SOC (Mg C ha-1 yr-1) for the decade 2000–2010, in agricultural soils of the EU. We coupled soil erosion into a biogeochemistry model, running at 1 km2 resolution across the agricultural soils of the European Union (EU). Based on data-driven assumptions, the simulation took into account also soil deposition within grid cells and the potential C export to riverine systems, in a way to be conservative in a mass balance. We estimated that 143 of 187 Mha have C erosion rates <0.05 Mg C ha−1 yr−1, although some hot-spot areas showed eroded SOC >0.45 Mg C ha−1 yr−1. In comparison with a baseline without erosion, the model suggested an erosion-induced sink of atmospheric C consistent with previous empirical-based studies. Integrating all C fluxes for the EU agricultural soils, we estimated a net C loss or gain of −2.28 and +0.79 Tg yr−1 of CO2eq, respectively, depending on the value for the short-term enhancement of soil C mineralization due to soil disruption and displacement/transport with erosion. We concluded that erosion fluxes were in the same order of current carbon gains from improved management. Even if erosion could potentially induce a sink for atmospheric CO2, strong agricultural policies are needed to prevent or reduce soil erosion, in order to maintain soil health and productivity. Please fill in the "Request form" in order to obtain access to these data; after which you will receive further instructions how to download the data. Lugato E., Panagos P., Bampa, F., Jones A., Montanarella L. (2014). A new baseline of organic carbon stock in European agricultural soils using a modelling approach. Global change biology. 20 (1), pp. 313-326. The data are made available for any activity even commercial. Lugato E., Panagos P. Bampa, F., Jones A., Montanarella L. 2014. A new baseline of organic carbon stock in European agricultural soils using a modelling approach. Global Change Biology. Global Change Biology 20 (1), pp. 313-326.